KFC, Kentucky Fried Chicken is a subsidy of Yum! Brands and it is easily the most popular chicken restaurant in the world. KFC was first opened in 1930 and since then has has witnessed positive growth with time, there are umpteen options for a chicken lover and at the same time vegetarian folks haven’t been left out. Their current count of restaurants stands at 18,875 spread across 118 countries (over 300 in India alone!). All their outlets look alike and this probably makes them a bit less interesting, but then folks at KFC have now come up with a new theme called ‘Hangout’ with KFC, an all-new concept store that is fun, earthly and vibrant. The word KFC brings back those memories when my dad used to get those chunky meat pieces from a KFC outlet that was near his office (Church Street), still remember the eagerness to get hold of that bucket of chicken and watch it finish in seconds!! Currently the outlet at Sony World Junction, Koramangala houses this new concept café of KFC and surprisingly this was the first ever KFC that I had stepped into. 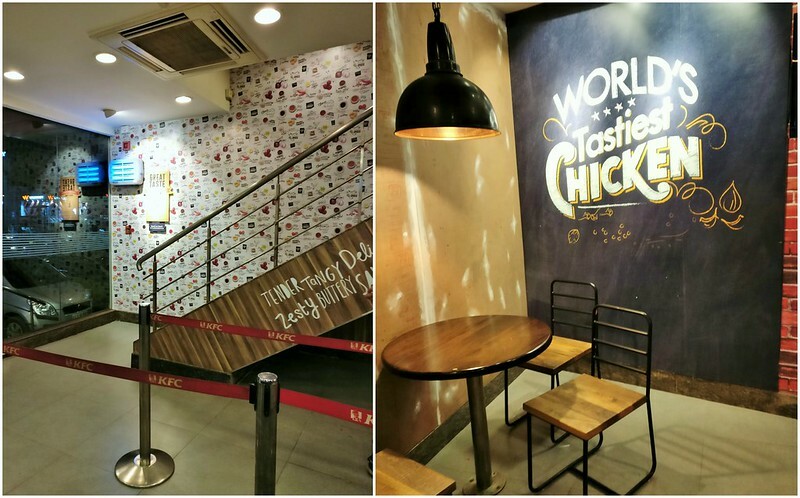 It actually felt nice when I got to see the revamped interiors which were in line with the overall traditional KFC theme but drifted slightly to give it a completely new look. There are new colorful wallpapers all around, subtle ambient lighting and completely new furniture setup which gives you a premium feeling overall. From food perspective, I have always felt that KFC products tend to suit a larger set of palate – Primary reason that you will rarely find a KFC outlet which isn’t bustling with crowd. When we was here to check out the new place we decided to order their new item on the menu – Nashville and the Smoky grilled chicken! Nashville range here is happy news for people who love spicy food! The chicken is marinated in a perfect blend of spicy cayenne and smoked paprika and comes with slices of spicy pickles. Click here to navigate to KFC India’s official website. Also, do follow them on Facebook to stay updated with current offers! Same here!! It has become part of my comfort food menu now ..